/ Modified jun 1, 2018 10:47 a.m.
Gov. Doug Ducey, right, and State Forester Jeff Whitney speaking to a crowd of land managers and first responders in Tucson Thursday, May 31, 2018. Public land officials met in Tucson Thursday to apprise Gov. Doug Ducey of fire conditions around Arizona. They warn of a dangerous fire season that has already burned more than 60,000 acres in Arizona, and a drought that is now more than two decades and counting. "We actually had pretty good growing season rains in southeastern Arizona last year," said State Forester Jeff Whitney. "Unfortunately, all of that acreage that burned last year had the benefit of that moisture and a lot of those fine fuels regrew." 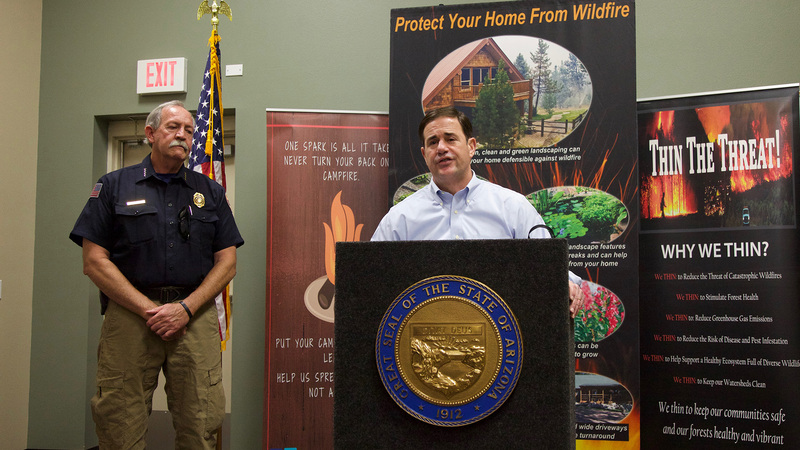 Ducey asked that Arizonans pay particular attention to activities that could start a wildfire. He warned that people need to be careful with campfire and cigarettes while in open spaces and pay attention to fire restrictions. He said they also need to secure tow chains and clear vegetation from around houses in rural settings. He also said that the federal government needs to do its part in when it comes to fire prevention on federal lands in the state. "We've got the best firefighters and law enforcement here in Arizona, but we need their help in Washington, D.C., so that we can have fire prevention." He said actions such as thinning of fire fuels and prescribed burns appear to be common sense to many in Arizona. "[Thinning and prescribed burns] will not only improve our forests in terms of health, they'll improve our watershed, they'll have fewer fires burning with less intensity," said Ducey. "But we do need some action on behalf of the federal government." The governor noted that this year's state budget double the funding for removing fuels to $2 million.